The Deliverance of Evil is shaggy book: it comes in over 600 pages, deals with multiple murders over a twenty four year period, and touches on government, police, and religious corruption in Rome. It’s an interesting backdrop, but the actual mystery didn’t grab me. The main character Michele Balestreri, is a Libyan-born Italian who was a Fascist in his youth, then infiltrated Fascist groups as part of the secret police before becoming a police officer in a quiet neighborhood in Rome. The book begins in 1982 as he’s part of a shoddy investigation into the murder of a young woman who worked for a Cardinal. He is a thoroughly unlikeable, misogynistic character in the first hundred or so pages of the book. He cleans up his act considerably as he ages, but this book fundamentally has a woman problem: they’re either objects of lust or murder, and not much else. It’s maddening. There was so much potential in this book, but it felt like it slowed down and meandered too much. 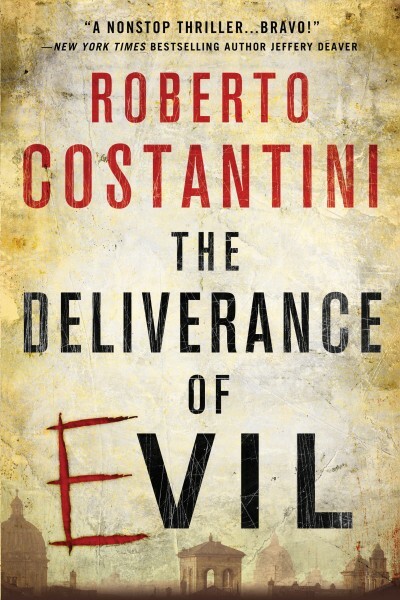 I understand part of that is because the investigation starting in 1982 was a mess, but part of it too was Costantini’s focus on personal stories at various points in the book that took away from the focus of this book’s plot. It may very well be a setup for the other books in the trilogy, though. Book two focuses on Michele’s past in Libya, which is only briefly alluded to in the first volume. I’ll be passing on it. For more positive reviews, see EuroCrime and Thinking about books. Dave’s review expecially made me realize that I’m not a fan of antiheroes in books though I don’t mind them on television shows. I prefer to sympathize with a character, any character, in a book, and I didn’t find that in this book because the main character was so unpleasant. Thanks, Rebecca, for your candor. Just from your description of the novel, it sounds as though you thought the book could have been shortened and the plot tightened up to good effect. I’ve read those other reviews too, and I honestly haven’t decided whether I want to read this. And it’s interesting what you mention about anti-heroes. Sometimes they work well, but when they have no redemptive qualities (or few of them) it’s hard to stay engaged in the story. Thanks for your comment, Margot. The positive reviews made me think I may have dismissed the book too handily, but I keep coming back to the thought that I want to enjoy a book at least at some level. Time to find something else to read! I agree – I have to sympathise/empathise with someone or the book just won’t work for me. And I’m so, so tired of women being treated as objects for the fantasies of male authors…think I’ll pass on this one! Thanks for the comment, FictionFan. I have to admit that part of the reason I finished is because I wanted to figure out why it was such a popular book in Italy (and it was hard to skim in the ebook version). Thanks Rebecca, it’s always good to have different opinions to help us decide whether we would like to read a book, and your reviews are always helpful in this sense. Thanks, Jose Ignacio. I enjoyed reading positive reviews of the book because it just wasn’t my favorite kind of read. I wanted to know what I was dismissing, I think. When I see a book is 600 pages, I just wilt. It has to be special for me to attempt it. I am working on reading some of the longer books on my shelves and finished one this month that was over 500 pages and I loved it. I will wait and see how the trilogy progresses. Thanks for the review. Thanks, Tracy, and congrats on conquering a big read! I wavered about posting a review of this one because it wasn’t my favorite, but I thought I had a little something to say about it. I think your thoughts are very worthwhile and I am glad you reviewed it. It did not turn me off of the book, just makes me want to take more time to decide. I’m glad to read this and know to stay away from it. Misogynistic protagonists turn me off faster than going out in a blizzard. true about books from Italy, too. Even the most popular Italian fiction writer, Andrea Camilleri, has been guilty of this in the Montalbano books, especially as the detective ages. He’s in middle-aged crisis often, having affairs, falling in love, despite his long-time fiancee, Livia. The books from Italy. which show fully developed, smart, capable women characters are written by a woman originally from the U.S., Donna Leon. I wonder if there are other works of crime fiction that show women as respected equals. I think I finished the book despite the main character because I expected him to really redeem himself, but it didn’t feel that way to me. As for other Italian crime novelists, I haven’t read many: I’ve read one or two Donna Leons and a little Camilleri, but I’ve avoided a few others like Carlotto because they don’t seem like my kind of thing. Time to start digging around for other Italian novelists!